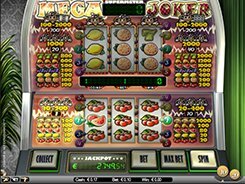 In Kings of Chicago, Net Entertainment combines a video slot layout that resembles a standard 5x3 reels configuration and a poker played with a 52-card deck (including a Joker card). In this game, you will not find usual spinning or falling reels. Instead, clicking the Spin button deals 15 cards that can form a winning poker hand, with the lowest-valued hand being Three of a kind. There are five fixed paylines, and a bet per deal ranges from $0.05 to $50. After being dealt 15 cards, you can earn a win if five cards form a poker hand on any of the five paylines. The most valuable hand is Natural Royal Flash that contains five same-suited cards in sequence, with Ace as the highest card. 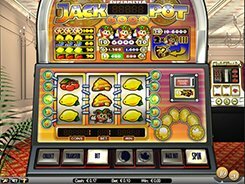 Getting a Natural Royal Flash awards x10,000 times your line bet (or $50,000 if playing at max). 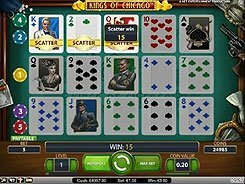 Kings of Chicago features Free Deals that act in a way similar to free spins in video slots – hitting three or more regular cards labeled as “Scatter” awards 10, 15 or 30 free deals with all payouts doubled. Besides, there is a Joker card that acts as a substitute for other cards to form a poker hand, and doubles payouts when substituting.